Indian Army Notification is out. 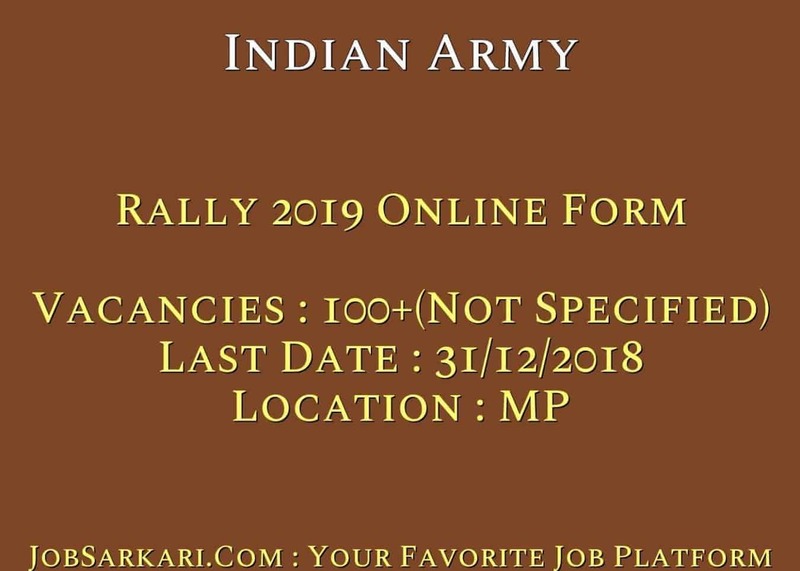 Indian Army is recruiting for 100+(Not Specified) Rally 2019 Online Form Posts. You can check Indian Army - Indian Army last date, download Indian Army notification, visit Indian Army official website and check other Indian Army Vacancy details.Complete Vacancy and recruitment Details about 100+(Not Specified) Rally 2019 Online Form vacancies in Indian Army are provided below by JobSarkari.Com only for you. Download Admit Card 20/01/2019 to 03/02/2019. Date of Rally 04/02/2019 to 18/02/2019. Soldier General Duty Candidate Must Have Passed Class 10th With 45% Marks in Aggregate and 33% Marks in Each Subject. 17 ½ -21 Years. 168 50 77 Cms After Expansion 82 Cms. Soldier General Duty (Scheduled Tribe Candidates) Candidate Must Have Passed Class 10th With 45% Marks in Aggregate and 33% Marks in Each Subject. 17 ½ -21 Years. 162 48 77 Cms After Expansion 82 Cms. Solider Technical Candidate Must Have Passed Class 12th in Science With PCM and English With 50% Marks in Aggregate and 40% Marks in Each Subject. 17 ½ -23 Years. 167 50 76 Cms After Expansion 81 Cms. Soldier Technical (Aviation/ Ammunition Examiner) Candidate Must Have Passed Class 12th in Science With PCM and English With 50% Marks in Aggregate and 40% Marks in Each Subject or Three Years Diploma in Engineering (Mechanical / Electrical / Automobile Computer Science / Electronic & Instrumentation). 17 ½ -23 Years. 167 50 76 Cms After Expansion 81 Cms. Soldier Nursing Assistant/ Nursing Assistant Veterinary Candidate Must Have Passed Class 12th in Science With PCB and English With 50% marks in Aggregate and 40% Marks in Each Subject or B.Sc Degree in Botany/Zoology /Bio-Science and English. 17 ½ -23 Years. 167 50 77 Cms After Expansion 82 Cms. Solider Trademan Candidate Must Have Passed Class 10th / ITI(08th Pass for House Keeper / Mess Keeper). 17 ½ -23 Years. 168 48 76 Cms After Expansion 81 Cms. Soldier Clerk / Store Keeper / Technical Candidate Must Have Passed Class 12th in Any Stream With 60% Marks and 50% Marks in Each Subject. 17 ½ -23 Years. 162 50 77 Cms After Expansion 82 Cms. Sagar, Chhatarpur, Damoh, Datia, Tikamgarh, Ashoknagar, Shivpuri, Sheopur, Guna, Panna, Bhind, Morena and Gwalior. Toga Sports Complex, Tikamgarh (MP). 6.Online Application Can be Submitted on or Before 31st December 2018. Q. 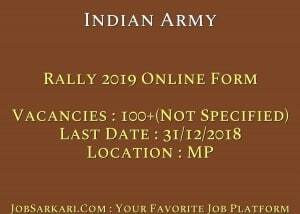 What is the Last Date For Indian Army Rally 2019 Online Form Vacancy ? A. Last Date for Indian Army Rally 2019 Online Form Posts is 31/12/2018. Q. What is the Form Type of Indian Army Rally 2019 Online Form Recruitment ? A. The Form Type for Indian Army Rally 2019 Online Form Posts is Online. Q. How many vacancies are available in Indian Army Rally 2019 Online Form Posts ? A. There are about 0 Vacancies in Indian Army Rally 2019 Online Form Posts.